We left Kep and our treehouse for Vietnam today. While the trip was technically fairly easy, I was really sad to leave Cambodia. 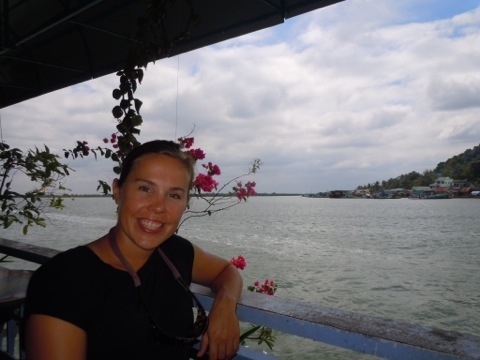 We didn’t spend as much time there as we did in Thailand, but I feel more of an affinity for the country and would love to have the opportunity to return and see more of what I missed. I'm assuming this says, "Welcome to Vietnam." However, time is always short and we have a (not set in stone) schedule to follow. 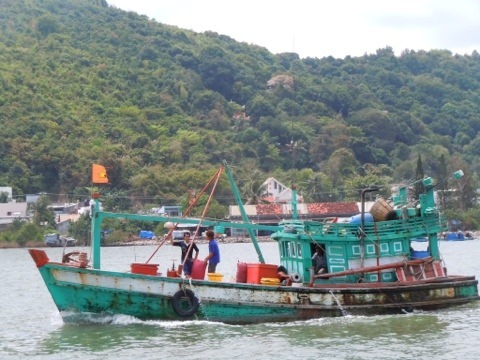 We had arranged for a bus to Ha Tien, just over the Vietnamese border, thinking that we would have more options for forward travel from there. We took a minibus from Kep to the border, crossed through the Cambodian exit with nary a hitch then passed under the arch into Vietnam. A bit of a wait for our passports, but our visas were good to go and we were soon back on the bus into Ha Tien. Whew--they let me in. On the Vietnam side of the border. Last night, we scoped out a hotel to stay in last night with our last few minutes of power and headed to the Dong Tam hotel without a lot of hassle. Getting a bus out of here to Vinh Long, though, was another story. 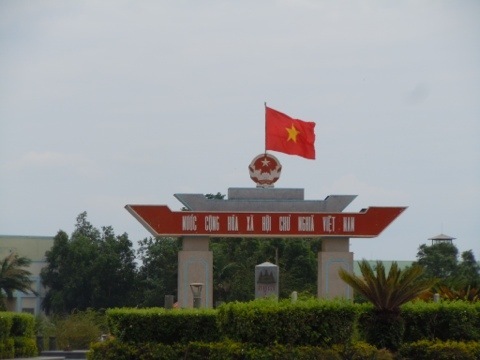 Ha Tien is a more recent border town–it only opened a few years ago and the town has not seen a huge influx of tourists. Most people come through the border and are on their way to farther cities. As a result, it’s quite different for us. There are very few people who speak English, though the kids are more than happy to shout, “hello!” as they pass by. We were lucky to find a nice guy who helped us figure out the bus to Vinh Long tomorrow, and our front desk guy speaks English, but that’s about it. We’ve managed to get along pretty well so far, but I’ve forgotten what it’s like to be out of the water with the language. We found a restaurant for dinner (with English menus) and had a great time looking at all of the food for sale. 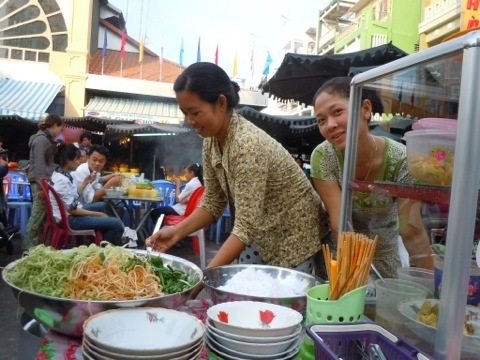 The streets really come alive after dark, with different stalls selling noodles, seafood, awesome coconut waffles, barbecue…a little bit of everything. Cheers! 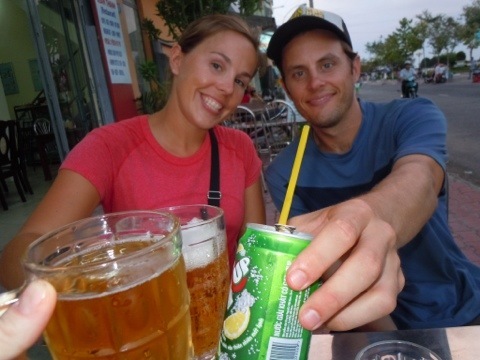 Our first toast in Vietnam. Through Mekong tours, which is fast becoming one of our favorite companies to travel with, we managed to get on a bus that would leave at 1 pm on Monday and get into Vinh Long at 7pm or so. Of course, the morning bus was full, but no matter. The bus doesn’t actually have a stop in Vinh Long, except for a snack, but they were willing to let us off there. This could either bode well, indicating a lack of tourists, or be ominous, meaning that getting out again might be an issue. We went with the positive outlook. Thuy Tien is a great spot for morning coffee, located right on the water; I think the cafe is on pontoons, so you get a bit of rocking as the barges go by. We had some breakfast and jet fuel that doubles as the super strong, extra sweet Vietnamese coffee before heading to the travel office to catch the bus. It was a incredibly scenic tour through the delta, with green rice fields alternating with harvested field melting into the mountains of Cambodia as we skirted the border. The “towns” are houses right on the main road, sometimes leaving enough room for maybe one lane of traffic–less if the rice is drying on the road. Chau Doc is much more expansive than I realized as we dropped off folks at their homes. After a brief stop, long enough to get some noodle soup and a banana/mango/sticky rice- grilled thing at the market, we were transferred to the big bus. It was a nice bus, quite comfy, and I was entranced by the Vietnamese music videos that they showed in the bus, all which seemed to feature a guy named Duy Beo and girl named Ha Vy singing sad song to each other under umbrellas. Actually, I was entranced for the first five minutes. Two hours later, a bit over these two. It was also quite interesting when the bus doors opened to let in ladies selling dinner boxes, packets of sticky rice, cold drinks, lotto tickets and other necessities. These ladies stayed on as the bus boarded a ferry to go across the river, then exited on the other side. We finally arrived at the private bus station outside of Vinh Long at about 9:30 pm. We thought the town was only about a mile away, but were soon informed that it was a 20 minute ride away. 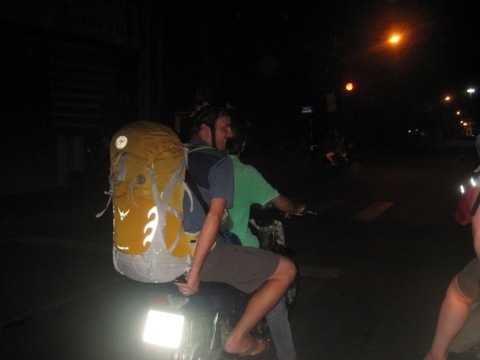 On a xe om, the motorbike taxis. I have never had a ride on a motorbike, or motorcycle or scooter or anything of that sort. It was one of the major things that Mama told me never to get on (along with a trampoline. I have other stories about that). But, it was the only way to our lodging, so I hopped on behind the nice man who spoke no English, telling him that I had never been on one, with my big backpack and prayed that Heather and Brian were right behind me and would end up at the same place. Xe om ride to Vinh Long. That's my leg in the right side of the picture. The ride was a bit surreal, as I was trying to stay as still as possible so as not to mess up the driver as he honked at other people and yielded to giant trucks carrying god-knows-what. I think he took it easy on me and, when he positioned my hand and feet where they were supposed to be (Brian later said I looked like “a deer on ice”), the ride was almost pleasant. We all arrived in one piece at the correct destination and was thrilled. Of course, my travel companions had a good time laughing at the petrified look on my face, but I think I did well, considering. Well enough to be perfectly happy to take another xe om ride when the situation arises. 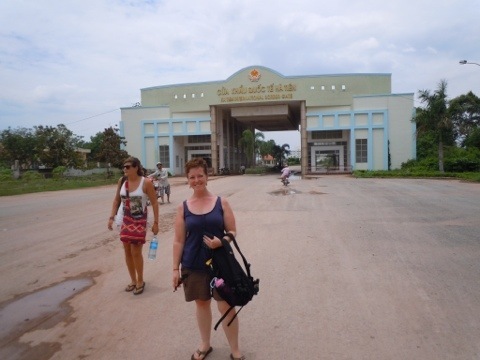 Tags: border crossing, Ha Tien, Vietnam. Bookmark the permalink.